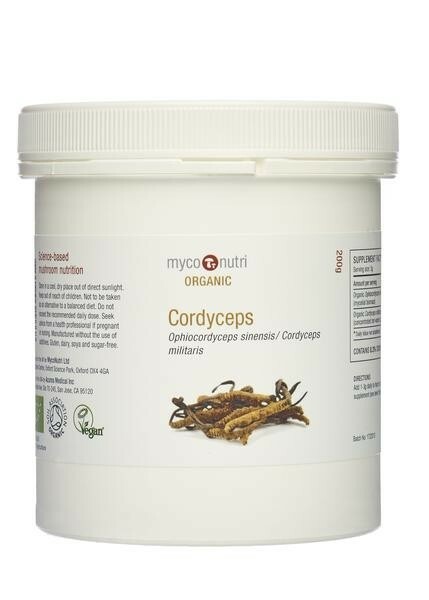 Many of the key active compounds produced by Cordyceps are secreted into the growth substrate and MycoNutri Organic Cordyceps combines full-spectrum Ophiocordyceps sinensis mycelial biomass grown in the USA under nature-identical conditions with a concentrated extract of cordycepin-rich Cordyceps militaris, combining these two powerful Cordyceps species. Ingredients: 133g Organic Ophiocordyceps sinensis mycelial biomass, 67g Organic Cordyceps militaris hot-water extract. Mushrooms4Life's organic full-spectrum Cordyceps is grown in the US under nature-identical conditions and contains both the mycelium and young fruiting body of Ophiocordyceps sinensis, cultivated into a biomass on edible, grain-based substrate. This format captures the full range of metabolites produced by the mushroom, including enzymes and extra-cellular polysaccharides, as well as substrate breakdown products (arabinoxylans etc.) and cell wall components (beta-glucans, proteoglycans and related heteropolysaccharides) while ensuring freedom from contamination. Soil Association certified and free from additives, pesticides, heavy metals or other contaminants. Suitable for vegetarians and vegans.